At China Adoption With Love, Inc., we believe it is important for families who want to adopt a child know about Chinese culture in Brookline, MA. Our international adoption agency offers this basic information so you can better understand the land in which your child was born. 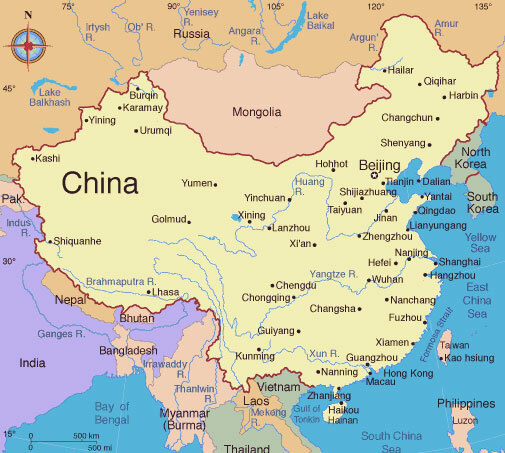 China, (People's Republic of China), is situated in eastern Asia, bounded by the Pacific in the east. The third largest country in the world—next to Canada and Russia—it has an area of 9.6 million square kilometers, or one-fifteenth of the world's landmass. It begins from the confluence of the Heilong and Wusuli rivers (135 degrees and 5 minutes east longitude) in the east to the Pamirs west of Wuqia County in Xinjiang Uygur Autonomous Region (73 degrees and 40 minutes east longitude) in the west, about 5,200 kilometers apart; and from the midstream of the Heilong River north of Mohe (53 degrees and 31 minutes north latitude) in the north to the southernmost island Zengmu'ansha in the South China Sea (4 degrees and 15 minutes north latitude), about 5,500 kilometers apart. The border stretches over 22,000 kilometers on land and the coastline extends well over 18,000 kilometers, washed by the waters of the Bohai, the Huanghai, the East China and the South China seas. The Bohai Sea is the inland sea of China. There are 6,536 islands larger than 500 square meters. The largest is Taiwan, with a total area of about 36,000 square kilometers; and the second, Hainan. The South China Sea Islands are the southernmost island group of China. It helps our children to build their self-esteem. It helps the bonding between child and parents on many levels. It helps our children to respect different cultures and people. It helps our children to develop more ways of thinking. It brings fun and different opportunities to our lives and our children's lives. What is the Chinese culture? Culture has many dimensions: Political, legal, religion, language, food, medical, musical, etc. Culture has many forms: Ruling and the ruled, regional, subgroups, etc. Culture has many shapes: Ancient, medieval, modern, etc. Culture has many evolving features: Some stretch through centuries and some change in decades. How much should our children, and we, as parents, learn about the Chinese culture? Raise your child like other children. Do not make them feel different. Make it easy and interesting for children and manageable in time and money to your lifestyle—holiday celebrations, games, storytelling, article cutting, ongoing events, etc. Check the resources in your community: Chinese church, Chinese language class, Chinese neighbors, other families who have knowledge about China, your adoption travel group, etc. If your child comes to the United States at an older age, it is OK if they refuse to speak Chinese right away. Still, try to keep their interest in Chinese. It could open up a world of opportunities for them. Allow your children to decide how much they want to learn when they get older. Food— Learn to cook healthy Chinese dishes at home. Language— Several sentences will deeply impress your child and every Chinese person with whom you speak. Medicine— Appreciate food, medicine, and self-treatment methods. Philosophical ideas—Yin-Yang, Crisis Is Opportunity, Pain Is Positive, Losing Is Winning, etc. Cultural Workshop—Our workshop covers Chinese history, Chinese politics, Chinese language, Chinese nationalities, holidays, food, etc. *For a partial listing of various resources to learn Chinese and Chinese Culture, please visit our Post Adoption Support page. Also, see information about our Cultural Workshops held in the spring and fall. It brings fun and different opportunities into our lives and our children's lives. Raise your child like other children! Do not make them feel different! Make it easy and interesting for children and manageable in time and money to your lifestyle: holiday celebration, games, storytelling, article cutting, on going events, etc. If your child comes to the States at an older age, it is OK if they refuse to speak Chinese right away. Still, try to keep their interest in Chinese! It could open up a world of opportunities for them. Where to start? - From the most mentioned Chinese subjects in America! Food - Learn to cook some healthy Chinese dishes at home. Language - Several sentences will deeply impress your child and every Chinese. Medicine - Appreciate food, medicine, and self-treatment methods. Philosophical ideas: Yin-Yang, Crisis is opportunity, Pain is positive, losing is winning, etc. Yes, come to our Cultural Workshop for more! This covers Chinese history, Chinese politics, Chinese language, Chinese nationalities, holidays, food, etc. *For a partial listing of various resources to learn Chinese and Chinese Culture, please visit our Support page. Also, see information about our Cultural Workshops held in the spring and fall. Contact us today to learn more about the vast and varied country of China to understand your adoptive child better. Headquartered in Brookline, Massachusetts, we help families across the country to adopt children from China.